What do you get when you mix rustic French cuisine and local, sustainable New England bounty? At Sel dela Terre, you get flavor-packed, air dried chicken with Foxboro Cheese Co. fromage blanc-black plum ravioli. Light but rich duck liver mousse. 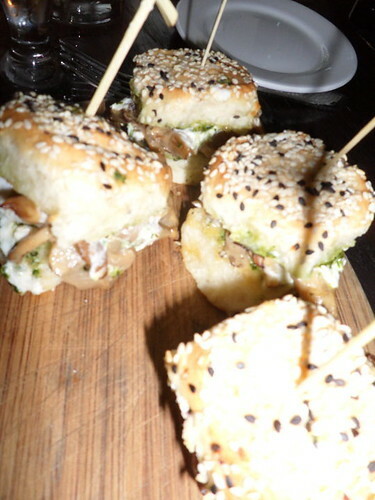 Sliders stuffed with marinated oyster mushrooms, pesto, and goat cheese. 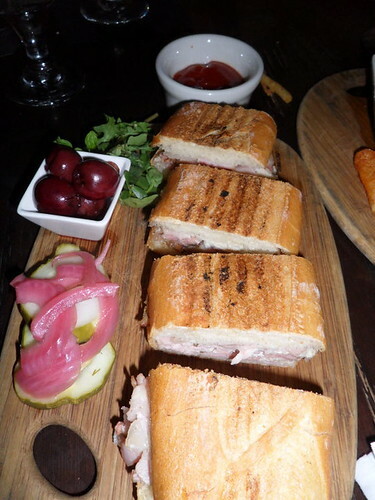 And a mouth-watering porchetta sandwich so well-loved in Boston that it has its own Facebook page and Twitter account. I’ve always liked Sel dela Terre and visit the Back Bay location pretty often. Not only am I a fan of Provencal cooking and the locavore movement, but I’m also a big fan of Chef Louie DiBicarri. I attended Chef Louie Night a few months ago (see my blog post here), a charity dinner featuring local foods, drinks, and a very large pig from Codman Community Farms, and it cemented Chef Louie’s place in my list of “Top Boston Chefs I Really Really Like.” In fact, I’m sort of a groupie. 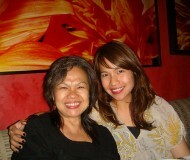 Last Monday, my girl friends and I went to Sel dela Terre to try the Bar Menu. Usually when I think of bar food, I think of greasy chicken wings, unimaginative sliders, oil-soaked fries, and nachos with overflowing toppings. 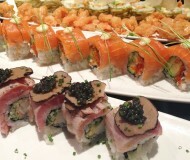 The bar food at Sel dela Terre was far from that. Sure, there were chicken wings, sliders, and fries, but grease seemed to be an unknown word in their kitchen, and the sliders were far from ordinary. We ordered sangria, chick pea frites, rosemary pomme frites, and a couple of sliders each since it was Mini Burger Monday. I got the oyster mushroom and the tuna salad nicoise sliders. Those mushroom sliders were fantastic! All four of us loved each and every bite. The tart goat cheese and the tangy pesto perfectly complimented the sharp flavor of the marinated mushrooms. I didn’t like the tuna slider at all though (but my friends did) – I only took one bite and left the rest on my plate. 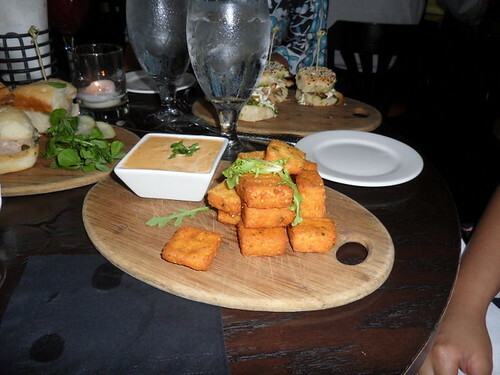 I figured I should save room (and calories) for the chickpea squares and rosemary pomme frites that we all shared. The sangria was the dangerous kind – it was so sweet and innocent-tasting, you forget there’s alcohol involved. Until you catch yourself laughing a little too loud because you’re already a wee bit tipsy. However, the highlight of the night was meeting Chef Louie, and him personally bringing down the famous porchetta sandwich. If you’ve never had porchetta and you’re a pork-fan like me (and Chef Louie), you have no idea what you’re missing. Porchetta is a fatty, juicy, boneless, roasted pig stuffed with rosemary, garlic and other fresh herbs which makes it oh-so-fragrant. When it is served as a simple sandwich, it will make you appreciate the power of simple ingredients and slow cooking. 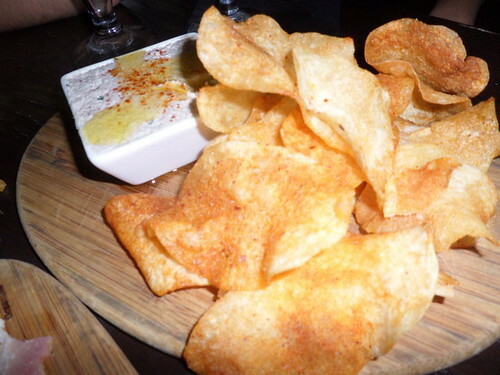 Chef Louie also served some potato chips alongside a creamy, swoon-inducing chicken liver pate. It felt extravagant to eat such rich (aka high calorie) foods on a Monday night (pomme frites! sliders on white bread! porchetta sandwiches marbled with fat! creamy dips! potato chips!). However, I am glad that the portions were small (and that I woke up at the crack of dawn to crank out some elliptical machine action). Even though I love the dinner menu at Sel dela Terre, I prefer the bar menu – not just because of the cheaper prices, but because it lets me taste little bites of indulgent dishes. I wish though that there are more vegetarian and healthier options, to keep things in balance. 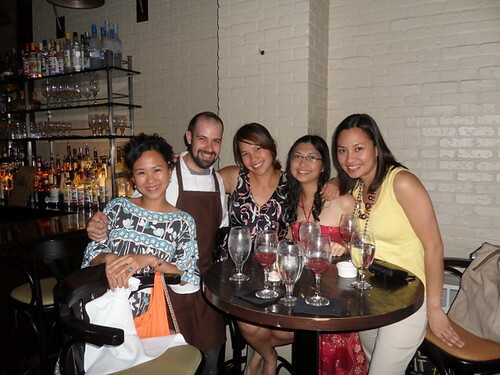 Chef Louie suggested that we reserve a chef’s table next time and I’m looking forward to that! The bread alone on the sliders had me at hello. and now i understand why the porchetta sandwich has a facebook page!